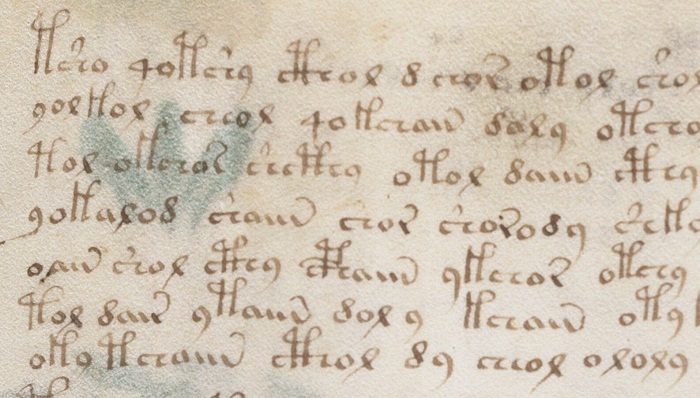 British professor Gordon Rugg believes the text in the Voynich manuscript is a meaningless letter sequence created with a simple “table and grille” method. Voynich manuscript expert Nick Pelling called this theory a “quasi-academic nonsense that only an idiot would be convinced by”. Here’s my summary of this debate. The Voynich manuscript is the most popular unsolved cryptogram in the world. This 230 pages hand-crafted book is written in a script otherwise unknown. The text of the Voynich manuscript could be encrypted, written in an unknown writing system or just be nonsense. Several dozens of text examinations conducted by cryptanalysts and other scholars have not led to a solution of the mystery. 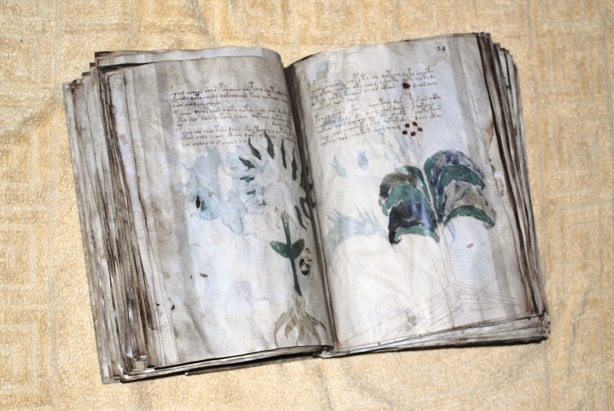 Much has been published about the Voynich manuscript. Many of these publications are mere nonsense. At least 40 Voynich manuscript scholars claimed to have decrypted the text, but none of these “solutions” has ever gained acceptance in the community. On the other hand, there are serious research papers, too. Some of these have been published in the peer-reviewed scientific magazine Cryptologia. In 2004, a Cryptologia paper written by British academic Gordon Rugg from Keele University caused a stir. Born in Scotland, Gordon has degrees in French and Linguistics and a PhD in Psychology. Gordon’s research focus is on techniques for solving complicated problems. 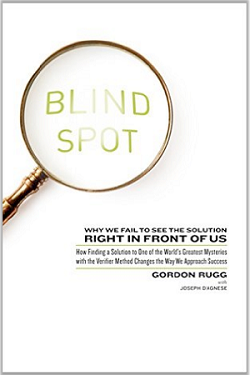 He has written a fascinating book named “Blind Spot”, subtitled “Why We Fail to See the Solution Right in Front of Us”. I can only recommend reading it. “Blind Spot” exposes the ways in which all people tend to make the same sorts of mistakes, regardless of what field they are in. In addition, Gordon introduces a universal problem solution strategy he calls “Verifier”. One of the messages in “Blind Spot” can be summarized as follows: If you can’t answer a question, though you try really hard, you should check if it is the right question you ask. I recently visited Gordon Rugg at Keele University near Birmingham. We talked about his book and about the Voynich manuscript. It was a most interesting conversation. Of course, the idea that the Voynich manuscript contains only meaningless gibberish was all but new. However, it is difficult to explain how somebody could produce a false (i.e. meaningless) text that looks like a real one (i.e., that shares many statistical properties with real language). Humans are very bad at producing completely meaningless letter sequences. If asked to try, most people will sooner or later start to write meaningful words or produce repeating patterns. As far as we can tell today, the Voynich manuscript text contains neither the one nor the other. 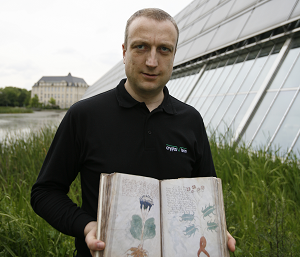 As a part of his Verifier method, Gordon Rugg asked himself whether there was a method to produce meaningless letter sequences that resemble the text in the Voynich manuscript. This method needed to be fast and simple enough to fill 230 pages with reasonable effort, and it had to be based on techniques already available centuries ago. This method, if it existed, represented the “blind spot” in the search for the origin of the text in the Voynich manuscript. If Rugg’s theory is true it should be possible to create the grilles used by a modest supercomputing effort. Die Table and grill Methode wäre schon schlüssig; es gibt ja noch andere Methoden wie man schnell was copy&pasten kann ohne dass es auffällt. Leider macht das trotzdem auch nur begrenzt sind, wenn man daran denkt, wie teuer die Farben damals waren und wie viel Zeit es gekostet hätte, ganz zu Schweigen von den Bildern. Es könnte natürlich sein dass es teuer verkauft werden sollte (oder Zutritt zu einer höheren Person ermöglichen sollte), der ‘Autor’ dann aber verstorben ist und das Buch verstaubt in der Ecke gelandet ist. Meine Meinung ist dass man die Bildern beachten sollte, diese sind nämlich keineswegs sinnlos. So gibt es ja Einzelteile der Pflanzen tatsächlich, nur eben nicht in der Konstellation (Einzelteile sind vertauscht), die Sternbilder, die teilweise detailreichen Frauen-Ufo-Wannen Bilder. Wenn das wirklich nur in Einzelarbeit entstanden ist, war derjenige sehr intelligent. Jedenfalls sehr guter Artikel und hoffentlich findet man irgendwann eine plausible Lösung die nicht so viele Fragen offen lässt. Ich schließe mich Derek Vogt an und sage, dass das in einer alten Romani-Sprache in einem semitschen Alphabet geschrieben wurde. Merkmale zu im Kaukasus vorhandenen Sprachen (v.a. Armenisch, Georgisch und Ossetisch) lassen sich ohne weiteres auch dadurch erklären, da diese einen Einfluss aus die Romani-Sprache hatten. Das EVA-d (sieht aus wie eine 8) steht für das t.
Vergleiche das Armenische տ sowie das Geogische თ + ტ (ohne den Ring unten). So manches mal, wenn ich armenische Buchstaben mit der Hand schreibe, fehlt nicht mehr viel und ich bin schon bei einigen VM-Buchstaben. Ein einfaches “t” dürfte für “und” stehen. Dass das “&” so ähnlich aussieht, ist für mich allerdings nur Zufall. Has any text created by the table-and-gille-method ever been published? It is nice to do movies about assumed creation methods – but I think it is much more important to publish material that allows other researchers to prove the represented theory. Hi Klaus, Gordon is an interesting and engaging chap, but that doesn’t make what he writes true. His Verifier Method is just one tiny micro corner of what is genuinely referred to in the literature as “higher order thinking”, or “metathinking”. Genuine metathinking is characterized by an alertness to the 100+ framing errors we can make when trying to solve difficult problems, along with a humility when faced by problematiques. Think about the creator of the script !! If he would only wantet to write random. bluberish” why he/she would not have done it ? Do you realy think that this person was thinking about statistikal textanalysis with computers. Dont think so he/she would have done just random “bluberish”, who should analyze this 300 years before ? Gordon Rugg may be an intelligent and engaging chap, but he has obviously no clue of the “making” of books in the late middleages. He should use his own “verifier” and ask himself the central question: why the hell should someone write more than 200 pages of complete nonsense, and who would pay for that? And the next question: what sense should a codex make if there was absolutely no one able to read it? Just a pastime for a bored monk in an underemployed scriptorium or the masterpiece of a phony guy with too much time and money? Forget about! (i.e. codicology/paleography), instead of misusing a popular codex for their own publicity. Nick: of course he can! Anyhow, give him a hug when you meet him on Saturday and tell him that ruggish is not the way it works. I think Mr. Gordon Rugg is wrong, it definitly does not work that way. Klaus Schmeh, wrote above about the “women” in the “UFO”, does he means the women in the seas? If yes, I’m sure that these women stand for the names of the seas. Please think about it. It is written in a phonetical kind of Latin. So the three women together stand for “MAR” –> like it is written on my old maps. The other women grouped together stand for the name of the sea, for example “ARAB” –> “MAR ARAB”. Have a look at the posture of the womens, every of them symbolize a character/letter, which is identifiable if you are attentiv. P.S. : Please excuse my spelling and grammar, English is not my native language. It could be that I’ve made some misstakes, like “attentive”, I’m sorry about that, but I’m here in the internet to improve my skills. So please feel free to correct me in a constructive way. If the words in Voynich were almost all the same length, this would seem reasonable. http://skyknowledge.com/voynich.htm But unless somehow you can make “words” that are composed of more than one block of text revealed by the grille; or if you have more holes in your grille and have some liberty of choosing longer or shorter words — this simply isn’t going to produce what is in Voynich. I find it hard to believe that the author has created such bizarre drawings and, in comparison, vast amounts of meaningless text. After so many could not crack this nut, the approach of the question is nevertheless correct. But it does not guarantee that the new question that G.Rugg asks is the correct one. i have not read much about the script, but could it be that the drawings and the “meaningless” text are not from the same person? Do writings produced with the grille-method satisfy the Zipf law? Does the Voynich text obey it? vroomfondel: my strong belief is that writings actually (rather than theoretically) produced with Gordon Rugg’s table-and-grille method will not (and never have, and never will) produce the same kind of writing we see in the Voynich Manuscript. Only by adding large numbers of additional arbitrary rules can Rugg’s method can be made to match the countless statistical micro-behaviours the actual text in the Voynich Manuscript exhibits. Which then utterly invalidates the entire point of the table-and-grille method as a supposedly simplifying explanatory mechanism. Let’s keep in mind that even Rugg himself has said for years that his demo could be used either to produce a hoax or to produce a valid encryption. And I don’t find his arguments for a hoax convincing. Along with the Voynich manuscript, one might dismiss the Zodiac ciphers, K-4, and Dora Penny’s cryptogram on the basis that they could have been created to resemble valid encryptions. As you alluded to, Klaus, it’s a matter of selective perception vs. critical thinking. No. What was the intention of the creator of the Book ? Thats the key. And think about, that the intention, we would not call science today. Thanks for noticing! I considered posting it here in a QWERTZ version, but decided to leave it as I had originally wrote it. I agree that knowing the intention of the creator of the VM would be a breakthrough that would probably get us to a quick solution. I’ve been interested, as you know, in finding results of such studies. My thought was that no such tests had been performed, which would mean that there is no baseline data of random written human output to compare really any of the well-known statistical analysis of the Voynich to. The only similar examples I had been aware of referred to spoken nonsense, like glossolalia. There are the famous case of Helene Smith in the 19th century, and a couple of others, which were not analysed in detail. Nonetheless they gave the impression to investigators that while meaningless, shared similarities to the language experiences of the speakers. I would be very interested in any such studies performed on written random output, however. And also, were the tests done using meaningful or invented characters? History is replete with examples of forgers producing hoaxes, either with no meaning, or with meaning unknown at the time they were offered for sale. In fact those who believe the Voynich genuine also accept that the work was not understood at any time in its history, and that Rudolf II nonetheless paid a great deal for it. That is, the answer to your question would be “Rudolf II would”. But a practical reason for keeping the content unknown, as in possible gibberish, would be to avoid historical errors of content, which would reveal a ruse. Many forgeries, with real content, have been uncovered because of such errors. … have, for over a century, failed miserably. This supports Rugg’s core claim in Blind Spot, that if you cannot find an answer, maybe you are asking the wrong question, in the wrong way. That is, if one took your advice and stuck purely to the existing scholarship of codiology and paleography… and for that matter, linguistics, botany, the history of alchemy and astronomy, and so on, that experience tells us they will continue to fail. The implication is that new ideas must be tried, and Rugg is one of a few mavericks who think of old, unsolved problems in new ways… which is historically the only way they really ever are solved. Richard: only someone with knowledge of the actual method used to construct the Voynich Manuscript’s text could honestly be able to say whether or not any given attempt to explain it “failed miserably”. Without that knowledge, such attempted criticisms are just empty rhetorical speculation rather than genuine critique. “… only someone with knowledge of the actual method used to construct the Voynich Manuscript’s text could honestly be able to say whether or not any given attempt to explain it “failed miserably”. In a very strict, rarefied sense you are technically correct, as some single one of many hundreds of competing theories could happen to be right. But so far, they have all failed to convince anyone, or more than a few others… and in that sense, even a correct theory lost in all the others is still a failure. I stand by my critique, until such a time as any are proven. Richard: getting to the truth isn’t (as one of my philosophy lecturers liked to say, in the good ol’ days before political correctness) as simple as being a judge at a beauty pageant. That is, the mark of a good theory is not that it is nice-looking, but that it is true… or that it helps us advance towards a more complete truth. In that latter sense, a large number of (non-all-encompassing) theories about the Voynich Manuscript might well be true. For example: that the VMs is in cipher; that it was made in Northern Italy; that it was made in the fifteenth century; that it was written by two or more scribes; that while some pictures are realistic, others are imaginary; that certain actions happened to it to rearrange its bifolios into the present order; that there was a later ‘heavy’ painter; and so forth. In that sense, I think we now have a lot of theories that could very well be true and built on the essentially solid evidence that you have been throwing scorn at for the last decade and more. This is (of course) the same evidence which is required to be false or faked by simulacra-narrative meta-theories (like yours and Gordon Rugg’s) in order that they can conceivably be true. So the reason that you talk about non-simulacra-narrative theories so disdainfully is that your own theory requires you to dismiss them as if they were all all-encompassing and completist theories. But that’s merely the standard straw man argument you wheel out each time: each individual micro-theory stands up on its own, and on its own set of evidence. Well I would agree that many of those points are correct, while others are not, or not known… but you are speaking of elements, not overall theories, which I was referring to. 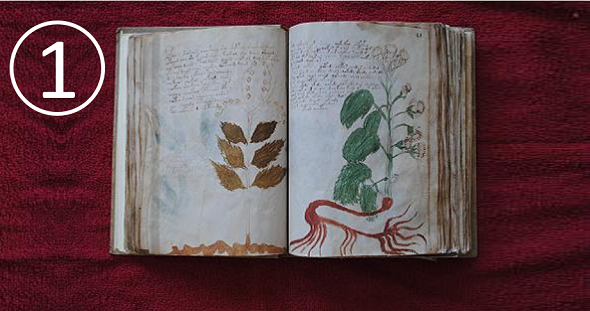 Sure we know various things about the Voynich, but we still don’t know, for sure, the who, what, where, when or why. That’s a failure to figure it out, in my opinion, and that it all I mean here. Richard: presumably your numerous attempts at constructing a workable non-fifteenth century Voynich conspiracy theory (from telescopes to Drebbel to Bacon to Voynich to whatever) are part of an entirely different success story, then? My Cornelis Drebbel, then later Francis Bacon theories were failures in the sense I meant also, yes. I was not excluding myself from my assessement. But knowing when one is wrong, and not becoming intrenched in, and married to, failed concepts, is a good thing, in my opinion. Perhaps I will stay here, or maybe I will see a new concept which makes more sense. How about you? I think your Averlino theory came out a year before my first, Drebbel theory, in 2006. Do you still think the Voynich Ms. was written by “… Francesco Sforza’s restless personal architect- Antonio Averlino”? Richard: that is irrelevant, the issue is more why you apply one standard of “success” to your own research and another standard of “success” to everyone else’s. Hallo Klaus. Ich finde deine Kolumne absolut großartig und kann sehr gut verstehen das du immer mehr auf Englisch schreibst, da du ja auch inzwischen viele internationale Fans hast. Kannst du es dir vielleicht dennoch vorstellen von den ein oder anderen Text eine deutsche Version zu veröffentlichen. Leider ist mein Englisch leider so schwach das mir das lesen von englischen Texten ab einer gewissen Komplexität erhebliche Mühe bereitet. Liebe Grüße wünscht tingel tangel Mel. Leider schaffe ich es im Moment nicht, meine Artikel zweisprachig zu veröffentlichen. Zwischen Deutsch und Englisch hin- und her zu springen, halte ich auch nicht für sinnvoll. Es tut mir Leid, wenn ich dadurch manche Leser enttäuschen muss, aber vorläufig will ich mich auf englische Beiträge beschränken. The Voynich manuscript is not written with letters and characters denoting letters of the alphabet one of the ancient languages. Moreover, in the text there are 2 levels of encryption. I picked up the key, which in the first section I could read the following words: hemp, wearing hemp; food, food (sheet 20 at the numbering on the Internet); to clean (gut), knowledge, perhaps the desire, to drink, sweet beverage (nectar), maturation (maturity), to consider, to believe (sheet 107); to drink; six; flourishing; increasing; intense; peas; sweet drink, nectar, etc. Is just the short words, 2-3 sign. To translate words with more than 2-3 characters requires knowledge of this ancient language. The fact that some signs correspond to two letters. Thus, for example, a word consisting of three characters can fit up to six letters of which three. In the end, you need six characters to define the semantic word of three letters. Of course, without knowledge of this language make it very difficult even with a dictionary. To the question about the Voynich manuscript. The text is written signs. Signs are used instead of letters of the alphabet one of the ancient languages. Moreover, in the text there are 2 levels of encryption. I found the key with which the first section I could read the following words: hemp, wearing hemp; food, food (sheet 20 at the numbering on the Internet); to clean (gut), knowledge, perhaps the desire, to drink, sweet beverage (nectar), maturation (maturity), to consider, to believe (sheet 107); to drink; six; flourishing; increasing; intense; peas; sweet drink, nectar, etc. Is just the short words, 2-3 sign. To translate words with more than 2-3 characters requires knowledge of this ancient language. The fact that some signs correspond to two letters. Thus, for example, a word consisting of three characters can fit up to six letters of which three. In the end, you need six characters to define the semantic word of three letters. Without knowledge of this language make it very difficult even with a dictionary.